The Chaplains/Pastoral Counselors Chapter of the Minister Council is made up of women and men who form a partnership of endorsees. We serve many different specialized ministries across the nation and globe. We are a diverse group and have a wide variety of competencies and specializations in ministry. We support our chaplain and pastoral colleagues with comradery, collaboration in ministry, consultation, and prayer. We provide the same spiritual support to our ABC-USA colleagues and congregations. Chaplains and Pastoral Counselors can, by the very nature of their specialized ministry potentially find themselves disconnected from traditional ABC-USA congregations, resources and colleagues. We believe this should not happen to ministers whose ministry is so central to the mission of the ABC-USA. 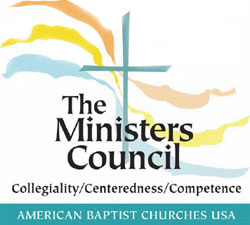 Membership in the Chaplains/Pastoral Counselors Chapter of the Minister’s Council can remedy much of this isolation and facilitate a sense of welcome, feelings of connection and access to support whenever it is needed. We are part of the ABC-USA family, including American Baptist Home Mission Society where the endorsement office is housed.